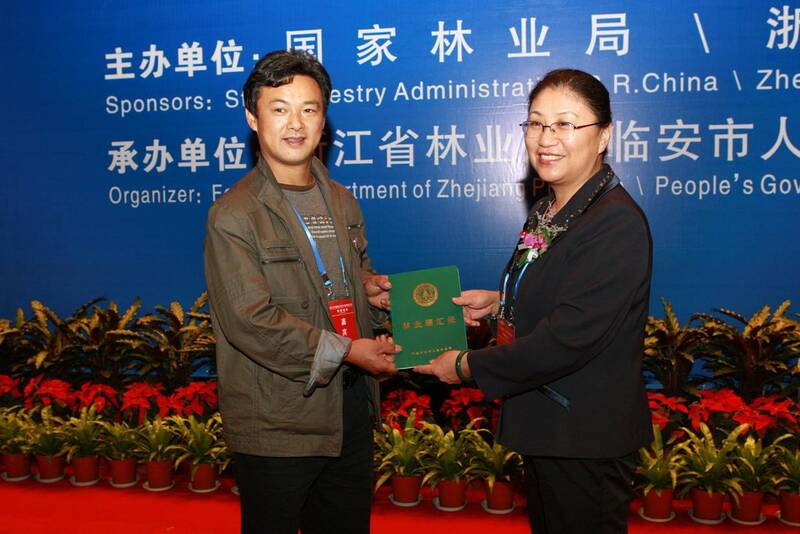 Co-organized by SFA and Zhejiang Province Government, the summit forum on “2010 China Carbon Forestry & Low Carbon Economy Development” was held on October 27th in Lin’an City Zhejiang Province. At forum, “Certificate of Forest Carbon” has been issued to ten experimental forest farmers for the first time which marked the initiation of piloting and testing households’ sustainable forest management and increase income from the accumulation of forestry carbon sink. In accordance with the pilot plan, the initial phase of “National Carbon Forestry Experiment Zone” has been arranged in Lin’an City in Zhejing Province. At the absence of carbon transaction market in China at moment, it is planned to purchase the pilot farmers’ forest carbon sink by CGCF. The pilot program aims at explore and test how to help the farmers engraining in sustainable forest management in their forest, improving forest quality and increasing forest carbon sink in the relatively long forest management period. The carbon forest farmers will earn certain amount of income from the carbon sink ecological service which helps to consolidate the forest tenure reform and make farmers better off. The issuance of “Certificate of Forest Carbon ” is based on the forest tenure reform certification and emerged as one means of expression of forest ecological value. In addition, it assists the farmers managing their forest in an even better approach. Especially, the afforestation motivation of public benefit forest and that in the economic underdeveloped areas from the farmers will be encouraged if certain amount of income can be generated from the sale of forest carbon sink. It comes to the clear understanding by the farmers that their managed forest not only bear direct economical value but also down-to earth ecological value even if their carbon sink credit have not sold out yet. “Certificate of Forest Carbon” is cognized as a proof of value for potential emissions discharge. Therefore it will bring about unprecedented exploration in its issuance, use and circulation management. The pricing of the forest carbon sink, dynamic administration as well as other unseen problems need to be addressed in the process of test and be eventually improved. As the first national public funding foundation dedicated primarily at combating the climate change and increasing carbon sink, CGCF is piloting and testing “Carbon Sink Forest Certificate” approach in realizing its goal for public welfare, consolidating forest tenure reform and giving the thrust to poverty alleviation and increase of farmers’ income. In the meantime, it helps foster the growth of China’s forest ecological service market dominated by carbon sink.